Commonsense may have prevailed. Apparently he was swimming at dusk also which isn't very wise. and another one at ballina. and the stats will show , no attacks while nets were up. So they took them down , and bingo! That will reignite the debate down there among the locals. But they don't use nets in the Whitsundays and only previously had one fatal attack in 60 years. You're right though, it will reignite the debate. Im sure I heard on the news this morning that they had smart drum lines in place at Ballina. No nets were in place, but when the nets were in place, recent stats on the nets for Ballina were near 400 hundred innocent marine life killed for just three sharks and I'm not even certain the three sharks were even the targeted species. The guy being interviewed nails it, nets would have been useless. And its amazing how the media from one website to anther differ the shark in size from just over a metre to 2.6 metres. I just watched it again, the guy being interviewed is the Mayor, someone buy the guy a beer!! the Nets by design shouldn’t stop anything, one wonders how the stats are so good when they are installed. Makes no real sense, but the numbers don’t lie. 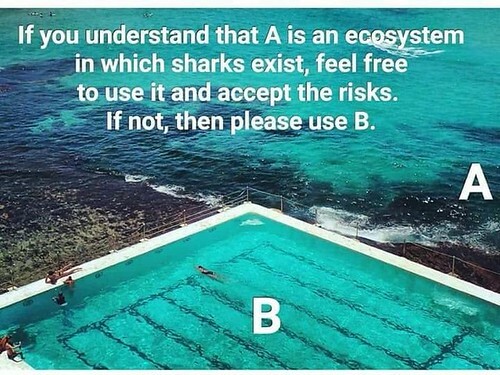 So nobody wants a cull , or other animals to die by drum lines ( be them innocent or guilty animals ) and everyone wants to be able to take a paddle in the ocean with minimum risk of being attacked by a shark. Impossible situation really. NO wonder the locals are so divided. I suspect part of the reason attacks drop when nets are in place is due to the bycatch in the nets attracting sharks. Sharks are often seen along the net lines from the air but not always caught. I spent 15 years robbing around the Whitsundays including at Cid Harbour and it was always known as a tiger shark habitat as turtles mate there every year at this time before heading to the quays and beaches. I believe these were either territorial attacks or mistaken identity. Either way , swimming at dusk is not that smart. Someone got grabbed south of Perth a short times ago. That will only fuel the cull crowd even more. This makes good sense to me . After all there are tens of thousands of people that get into the sea every day for all sort of activities and don't have any problems from sharks. I reckon I've been in the ocean roughly 9000 times and only had a few sharky encounters without any injuries. Although I do feel for those that do get bitten. well theres no solution just yet that suits all parties. Ballina is divided over it. Most prefer no drum lines or nets , however they also want to live the beach lifestyle with kids coming up through the nippers & surf lifesaving culture, and if it takes nets to keep that in place , so be it. Growing calls at council that if they arent prepared to re install the nets , then they should make the council pool free entry. Be interesting to follow what they do. Make it free for ratepayers and charge tourists. If you dress like a chocolate crackle and a fat kid bites you then its your fault. Now change chocolate crackle for dressing like a seal and the fat kid is now a shark. I'd forgotten about chocolate crackles. Haven't had one for years, maybe decades! Its your life use it as you see fit, don't whinge if life bites you back. Chocolate crackles were a fav as a kid. Went for a swim at Ballina yday, chopper overhead, as im paddling out, shark alarm goes off,,sheesh.. Bloke can't even have a swim in the ocean anymore. Haha. I used to do a lot of fishing at Iluka breakwall( among other coastal spots). I don't think surfers have any idea just how many big sharks are always close by to them. Especially around the mouths of the northern rivers. There were days when it was impossible to get a fish back to the ledge they were often eaten within seconds of being hooked and i am talking tuna in the 10-20kg range getting bitten clean in half with one bite. Yea they should rid the planet of everything that can hurt humans including humans. Reports of a shark attack in Queensland have been dramatically downgraded, with the culprit now thought to be something a little less likely to strike terror among swimmers. 5 registered (snowbooby, Alex_96L, Mike Hauber, Multiversity, 1 invisible), 57 Guests and 2 Spiders online. Generated in 0.033 seconds in which 0.019 seconds were spent on a total of 14 queries. Zlib compression disabled.